Part of The Noble Collection’s Batman Collectible Series. This original character depiction was hand sculpted by Karl Deen Sanders. The Noble Collection is the officially licensed creator of movie merchandise, specializing in finely crafted treasures, movie props and collectibles. They create original collectibles by employing the most talented sculptors of our time to deliver unique wares. 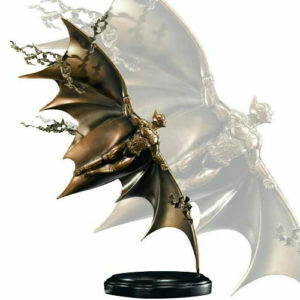 Development of this flying Batman bronze sculpture was officially authorized by Warner Brothers for production and sale through the Noble Collection. You can buy this original sculpture from the Noble Collection website. 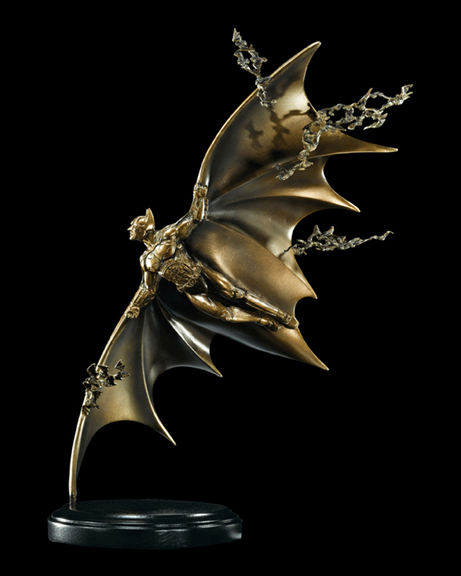 This Collectible Flying Batman Sculpture in Bronze was produced exclusively for the The Noble Collection – the company that has established a premier position in collectible swords, knives and daggers. By bringing heightened concept, detailed sculpture and design to each piece, the company has set new standards that have captured the loyalty of seasoned collectors, and brought a new generation of enthusiasts into this revered art form.